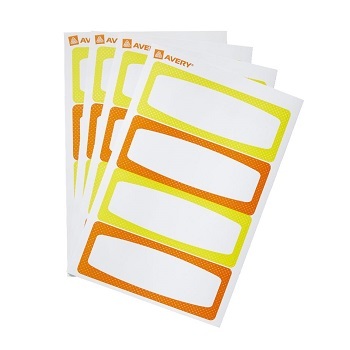 Help kids identify and keep track of their belongings with these bright tear and water-resistant Durable Labels. They are perfect for labelling day-care, school and camping gear, lunchbox items, bottles, sporting goods and electronic devices. These labels are made with TrueBlock® Technology which is guaranteed to completely cover anything underneath. Great for labelling school and camping gear, lunchbox items, sippy cups and more. Dishwasher and microwave safe. Wipeable and UV resistant. Works best with permanent markers. Pack of 5 sheets (20 labels per pack) - Yellow and Orange colours. Durable Material - Permanent adhesive. Pack of 5 sheets (20 labels per pack) - Blue and Green colours. Pack of 5 sheets (35 labels per pack) - Assorted colours. Pack of 5 sheets (35 labels per pack) - Blue, Green and Red colours. Pack of 5 sheets (60 labels per pack) - Blue, Green and Red colours. They are great for labelling almost any item including lunchboxes, bottles and sporting goods as well as day-care, school and camping gear. The self-laminating feature protects your writing and helps keep the label surface clean and protected. Pack of 48 labels in assorted shapes and sizes in bright neon colours. When clothing goes missing or finds its way to the lost and found, ensure that it is returned to its rightful owner using the Avery No-Iron Clothing Labels. These labels adhere to clothing without the need for an iron. Pack of 45 labels in assorted shapes and sizes in bright neon colours. Durable Fabric Material - Permanent adhesive - Work best with permanent markers.